Less than a year after becoming the youngest-ever member of the exclusive 500 Home Run Club® on August 4th, 2007 Alex Rodriguez (537+) has continued hitting homers at a furious clip...and has moved up to 13th on the all-time leader board. Next up: Philadelphia Phillies great "Iron" Mike Schmidt (548). 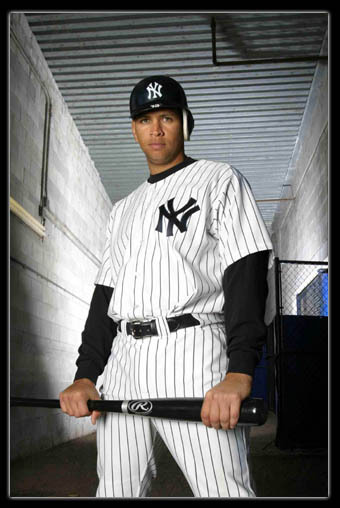 Alexander Emmanuel Rodriguez (aka A-Rod) wrapped up his third MVP award in 2007 (two with NY Yankees and one with Texas Rangers) by accumulating awe inspiring 54 long balls and 156 RBIs, and was the single biggest reason that the Yankees wrapped up the AL wild-card spot last year. "When you're hot, there's really not a lot to think about," manager Joe Torre said. "You just react. A lot of times, when you're in a little bit of a slump, you over-try and start thinking about it. I think where he is now, he doesn't want to think about it, because it's working so well for him." 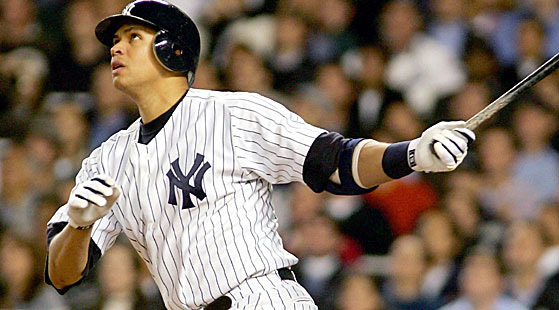 At age 32 and 8 days, Alex Rodriguez was the fastest to 500 (on August 4th 2007), and still has many power-hitting years ahead of him. In fact, many baseball pundits are saying that he is heir apparent to catch and eventually pass Barry Bonds career home run mark. Rodriguez has credited his batting cage work with Yankees hitting coach Kevin Long as a major reason for his success. Long said that Rodriguez maintained much the same workout regimen from the first day of Spring Training, a seven-week period in Tampa, Fla., when those in uniform noted how much more comfortable and confident Rodriguez has looked at the plate throughout the 2007 season. "I've been at peace for a while," Rodriguez said. Long said that Rodriguez's daily routine has provided structure for Rodriguez, a player who thrives upon his preparation. "He's diligent with his work," Long said. "He does it every day; it starts off with the tee, just working on staying square and staying short, and staying compact to the ball while using all fields." "I'm enjoying it," Rodriguez said. "It says a lot about the three guys who are hitting in front of me and the protection I'm getting behind me. The reason I'm getting pitched to is those guys behind me -- they get a lot of respect. I just want to finish strong."